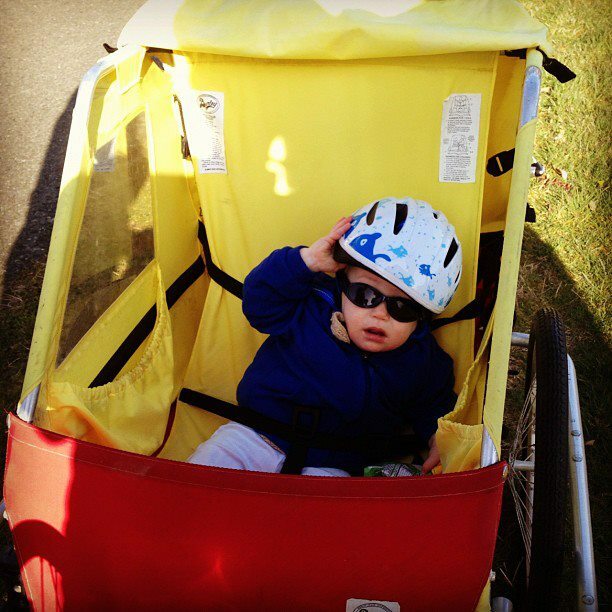 Ben went for his first bike ride in the trailer this morning. We biked along the Burke Gilman trail and had breakfast in Lake Forest Park. Despite our outing being no more than seven miles (roundtrip), it was my first time on a bike in about two years (pre-pregnancy). Let's just say that someone has a very tender posterior this evening. We're sitting down very delicately. And by 'we' I mean me. Ben did ok in the trailer. We need to mess around with the restraint system a bit. I thought the straps were too high and whenever we tried to adjust them, they became too loose and he tilted precariously to the side. So this biking thing is a work in progress. This afternoon we zipped over to Bellevue for a Willamette University event. Chris and I got to play the part of alumni representative and meet lots of prospective WU students. Hopefully we did decently well and didn't scare too many of them off. Fingers crossed on that one. (Just kidding, POL. We behaved ourselves). Ben (class of 2029) got to hold down the fort with my parents. The best part was that we got to see my old pal Pete (Hello, Pedro!!) and meet the new university President. A good day, indeed. I hope you had a great weekend, Peeps. Looking forward to working with that Class of '29 future Bearcat! :-) Great to see you guys, and thanks for coming!